There are few things adventurous scooterists like to hear more than the incredulity in the voices of many they encounter during their travels. The comments often begin with “You rode all the way here…” or “You rode through there…” and inevitably end with “…on THAT?” Though “all the way here” might only refer to the other side of town, the surprise and disbelief are sometimes understandable. Until recently, few scooters were built with the intent of being subjected to long distances and being ridden through sand dunes in Dakar, jungles in Indonesia or cliffsides in the Himalayas. Yet all of these places have been conquered by valiant riders on scooters being ridden far outside their original purposes. Like in the NC series, the engine is center-mounted. The rear wheel is on a swingarm, driven by a chain. No CVT transmission; we make a good guess as to what it has in the next section. The body is streamlined, and it appears that onboard storage is fairly limited. The all-digital gauge cluster is compact, with much of it on a GPS-sized device on an arm. Shots from EICMA have shown some type of info interface displayed on the screen. This might come with a navigation system. The front fairing is scaled down compared to most maxiscoots, with an adjustable windshield. Overall, there’s less plastic jutting out where it would be likely to swipe up against a boulder (or SUV). The ergonomics are definitely adventurous, with a tall seat and upright handlebars. It could be a tight fit for some riders. The second generation Integra integrated seat and legshield changes to allow more space for longer legs.There’s not much foot room, but the floorboards look ready to stand on while scurrying over rocks and dirt. The tires feature semi-knobby dual sport treads for riding on road, riding off road, crossing streams in the Amazon, and crossing the mall parking lot. There are disc brakes on both ends; these appear to be the same 3-piston (front) and one-piston (rear) units on the Integra. While the front is the same 17-inch size as the Interga, the rear is a smaller, but wider, 15-inch tire. This provides extra stability and more surface area and grip when riding up the side of Mayan pyramid in Belize. The engine will be a fuel-injected 750cc parallel twin. The Integra gets around 66mpg and tops out at about 115mph. The wheels on the City Adventure might cut into both of those numbers, but not drastically; lighter weight would compensate for some of it. Fuel capacity will be 3.7 gallons. The transmission will be the same dual-clutch as the Integra, offering a manual mode and two automatic modes. Additional or alternate modes provided for adventure purposes could be provided with a few software changes. Suspension will begin with the sporty 41mm forks found on the other models. The rear monoshock appears to be longer or sit lower than the Integra’s, providing extra support. It could be as much as 100lbs. lighter than the 525lb. Integra. The NC700X is about 50 pounds lighter. Extra storage will be available from Honda in a Touring Pack set of hard cases, as is available for the others in the NC series. If it moves forward to production, the City Adventure will likely never be sold in the US. 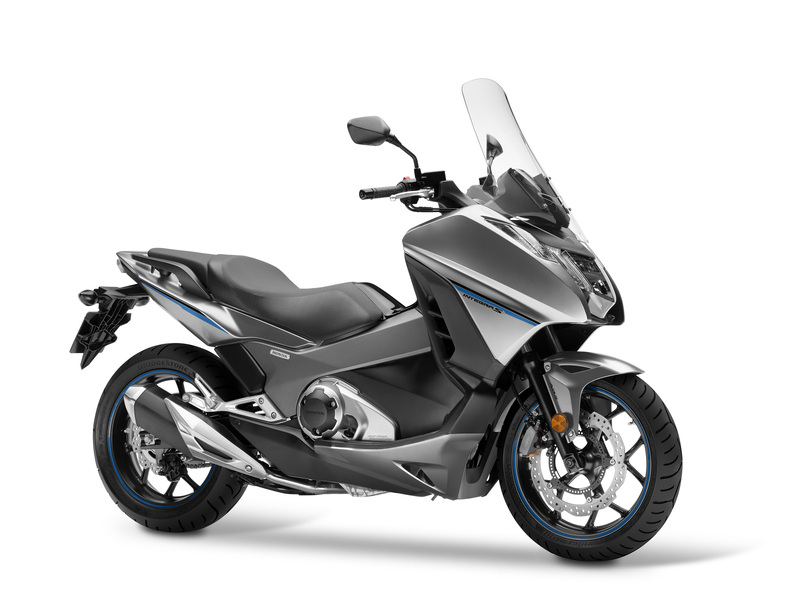 The American market for such a scooter is small, and the Adventure would compete with the NC700X already being sold here. You may have to go to South America to get one, but riding it home would be epic. Chicago Alderman Patrick O’Connor uses his Genuine Roughhouse 50 around the 40th district where he represents as Alderman.